We are proud to introduce a new contest here at Hackaday. Buy Break Build will be regular event where we challenge you to make something from something else. We want to work out your hacker brains to come up with inventive ways to use limited parts. We may have a specific product or genre in mind, and a specific out come we would like to get, then we let you guys loose to make it happen. The contests will usually be judged for winners in 3 categories; best presentation, best use of only the existing parts, and most massive overkill. You don’t have to be an electronics engineer, or even know how to program a microcontroller. You simply document your entire hack with pictures and notes, then submit it to BBB@hackaday.com and we’ll choose the winners. Those winners will be awarded fabulous prizes and Internet fame as we’ll publish your writeup for everyone to enjoy. Here’s an example to make things a little more clear. Don’t actually go do this one, it is just an example. Contest: Radio controlled faces. Everyone has an old R/C car lying around right? Can you use those parts to make an animatronic face? It doesn’t have to be humanoid, but at least recognizable as a face. There would be 3 winners, the one that made the best use of only the included parts, the one that had the best presentation, and the one that went absolutely the furthest overboard. Remember, this one is just an example, so please don’t run out and get started just yet. We’ll be announcing our first Buy Break Build very soon. [Socket7] got his hands on a projector that had some color calibration problems. Of course the servicing manual says that there are no technician serviceable parts inside, but he cracked it open and fixed it anyway. This is an Epson PowerLite 5500c which was showing blue and yellow bands around the outside of the projected image. He could hear something rattling around inside which happened to be the lenses. It turns out there are foam pads that hold them in place that had shriveled over time. After a bit of careful work he replaced them and now has a working projector. We’d love to have a projector of our own; there’s a lot of cool stuff you can do with them. Fixing a broken one is a great way to get one cheap, [Socket7’s] was free! 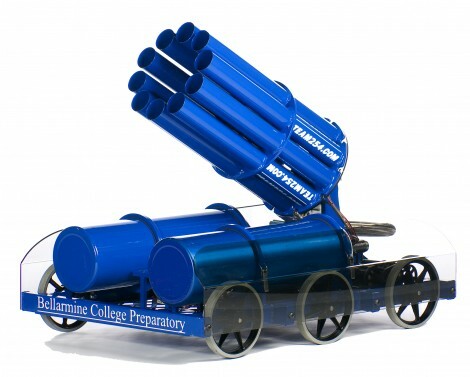 The newest addition to the Skynet armada is this 10-barrel t-shirt cannon. It’s capable of storming the battlements at over twelve feet per second with a firing rate of three T-shirts per second (ooh, is that cotton?). The members of Team 254, which is hosted by Bellarmine College Preparatory School, built the robot over the summer. This involved a full production cycle; planning, 3D modelling, acquiring the materials, and finishing the build. All of this is well documented in their build blog and for video, check out their media page. We already know how to customize the T-shirts for use as ammo, now what this needs is some tank treads. 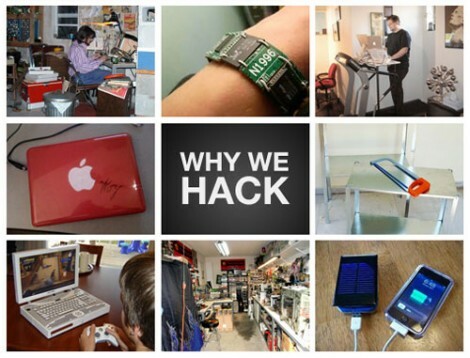 [Adam Dachis] published an essay a couple of days ago called Why We Hack. In it he discusses the outlook that hacking, on all of its various levels, is a simple form of disobedience. We have to agree with him. Manufacturers would like you to think that voiding the warranty is as good as smashing the product to bits. But we all know that if you can’t crack it open you don’t really own it. [Adam] says we can sit around and complain about it, or we can do better. So crack it open, dump the firmware, and make it do your bidding. If you haven’t already seen it, you should also go back and watch [Corey Doctorow’s] keynote address from Toorcon 8. He discusses freedom of information and hits especially hard on End User License Agreements (EULA) and the ills they cause. We’ve never seen someone hit the target quite as well as he does in this fantastic speech. You’ll probably lose your appetite after watching part one and part two of Artisans Asylum as they Take on the Machine. Based around the Wallace and Gromit “automated” set of contraptions, the team from Boston set out to make their own breakfast machine. Of course, with only three weeks to work it didn’t exactly turn out as planned. They certainly had some good ideas though, and we were amazingly impressed at their egg cracking machine. But in the end, we wouldn’t want to be first in line for a plate of breakfast. Next is the final team, The Transistor, who will be making a live action zombie video game.